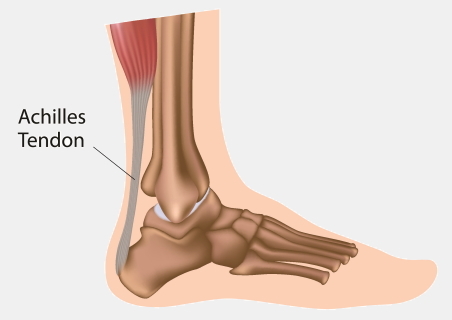 You have an Achilles tendon on each leg – it joins your heel bone to your calf muscle, at the back of your ankle. Achilles tendinopathy is a condition that causes pain, swelling, and stiffness in these tendons. Achilles tendinopathy used to be called achilles tendinitis. While the cause isn't certain, doctors think this happens because of repeated tiny injuries to a tendon, or overuse. Several things can cause these injuries – they are common in dancers, people who run regularly, and people who play a lot of tennis or other sports that involve jumping. How do I know if I have Achilles tendinopathy? Some people who have Achilles tendinopathy have pain in their tendon while exercising, but usually it's worse once they stop. Runners can notice pain when they start running, but it then tends to become more bearable during the run. However, it gets worse once they stop. You may also notice pain when you touch the area around your Achilles tendon, and it may also be swollen. The pain caused by Achilles tendinopathy can stop you from doing normal everyday activities, such as walking to the shops. If you get sudden, severe pain in the back of your leg and have difficulty walking, you may have torn (ruptured) your Achilles tendon. Some people say the pain feels like being hit in the leg, or they hear a snap or crack. See a doctor urgently. What should I do if I have Achilles tendinopathy? There are several things you can do yourself to treat this condition. If you follow the advice below, your symptoms should get much better within seven to 10 days and you should be able to slowly build up your level of activity. As long as your symptoms are improving, you don't need to see a doctor. For most people, the symptoms completely go away within three to six months. Resting and taking time off sport are important. At first you should totally stop any high-impact sport, such as running. However, resting completely for a long time might actually make the injury worse, so as the pain starts getting better you can start exercising again. Talk to your doctor or physiotherapist if you're not back to normal after a couple of weeks. Taking paracetamol (Panadol) or ibuprofen (Nurofen) can help to relieve your pain. Ibuprofen belongs to a group of medicines called non-steroidal anti-inflammatory drugs (NSAIDS), and you shouldn't take any of these for more than one to two weeks. NSAIDs might stop your tendon from healing in the long-term. They might also mask the symptoms, which can also delay healing. Talk to your health professional if you still need pain relief after one to two weeks. Ice treatment can help to control the pain and reduce swelling in the early stages of Achilles tendinopathy. You can use it as long as your leg is swollen. Ice slows down blood flow to the damaged tendon, which helps to reduce pain. Make an ice pack by wrapping ice cubes in a plastic bag or towel, or even use a bag of frozen peas. Don't put ice directly on your skin, as it can cause an ice burn. Gently press the ice pack on to your Achilles tendon area. Use ice for 10 to 30 minutes at a time. Less than 10 minutes has little effect. Longer than 30 minutes may damage your skin. Don't leave ice close to your skin when you are asleep. Two stretches can help your Achilles tendon to heal: the long calf muscle stretch and the short calf muscle stretch. Do each stretch for up to one minute, and do this two to three times a day. Stretch slowly, and don't bounce. You should feel a pull or ache, but it should return to normal once you release the stretch. If it still hurts after the stretch, be more gentle next time. Keep doing the stretches until your symptoms go away. If you haven't started to improve within 10 days it's best to see a physiotherapist or podiatrist. However, your GP can also help with general advice, pain relief, and a work certificate if you need one. You can search using this link if you need to find a GP, Podiatry New Zealand if you need to find a podiatrist, or Physiotherapy New Zealand if you need to find a physiotherapist. Written by HealthInfo clinical advisers. Endorsed by physiotherapy liaison, Canterbury Initiative, Canterbury DHB. Page created July 2016. Journal of Applied Physiology – NSAID therapy effects on healing of bone, tendon, and the enthesis, retrieved July 2016. Sports Medicine, Arthroscopy, Rehabilitation, Therapy & Technology – Anti-inflammatory management for tendon injuries – friends or foes?, retrieved July 2016.